As we like to point out every year, InfoComm is one of our favorite shows because there are so few venues where you can actually go and "kick-the-tires" on so many visual collaboration offerings under one roof. It is also a pleasure to get to see so many old friends and make new ones. 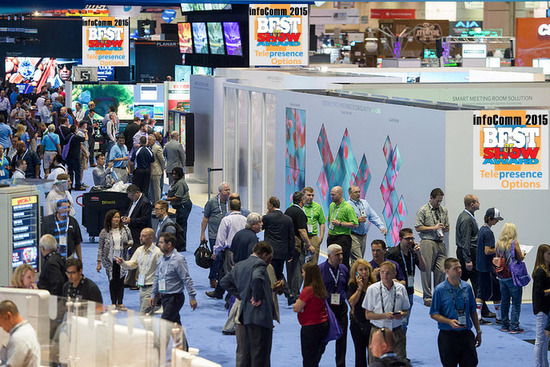 This year InfoComm set a new all-time high attendance record with 39,105 attendees from 108 countries visiting 950 exhibitors in 515,000 square feet of exhibit space. Bigger IS Better (especially for collaboration!) - For knowledge-based organizations the real ROI of collaboration is both improving and accelerating the rate at which knowledge is created, shared, understood, evaluated, and acted upon. This is going to be the main focus of next issue of Telepresence Options Magazine coming out in November that we are renaming: Visual Collaboration Magazine. In group meetings or presentations, whether local or virtual, just being able to effectively share detail-oriented content like a spreadsheet or a visio diagram with a room full of 40-somethings whose eyes are starting age is job #1 and the bigger the screen the more effective you succeed. But improving readability is only one of the benefits of big pixel spaces: Many of the wireless data sharing tools like Mersive Solstice and Kramer Via Collage and interactive display solutions like the Nureva Span, Prysm Collaborative Walls, and Oblong Mezzanine offer the ability for multiple presenters to share data simultaneously which is definitely a power feature in group collaboration and the ability to keep "persistent data" virtually thumbtacked to a portion of the display is helpful in a variety of meeting types. Interactive Display - Interactive Display is my new umbrella term for display solutions that are integrating multi-touch interaction and a collaborative PC at a minimum but are frequently including advanced collaborative tools such as wireless data share, multi-site collaboration and mirroring, interactive whiteboarding, videoconferencing, and workflow tools that super-charge both group and virtual collaboration.The big buzz was around the recently launched Microsoft Surface Hub which has integrated Jeff Han's work from Perceptive Pixel and InFocus who was showing off their MondoPad 2.0 and SMART Technologies was launching their SMART Kapp IQ. I stopped by the Planar booth to look at their 98" 4K multi-touch UltraRes interactive display but it wasn't working properly so I wasn't really able to review it. I am including the SMART Kapp IQ in this category even though they are going in a slightly different direction forgoing the collaborative PC in favor of a simpler approach where the screen/board is paired with IOS & Android apps for bi-directional sharing. 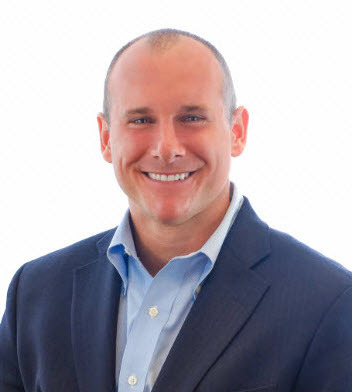 I spoke with Jeff Lowe, SMART's CMO, who told me one of the most fascinating things I heard on the show floor: He was just back from the NeoCon furniture show where they think they have have simplified the product to the point where it can be bought by facilities vs. IT and sold by the same office furniture suppliers that sold you a traditional dumb whiteboard and/or display last year. Ideation and Visualization Environments: Moving up the size/price continuum are projected solutions with interactive touch with the big story being the launch of the Nureva SPAN, an interactive touch solution for ideation with two models: The WM210i with a 10" x 4" superpanoramic display and the dual projector WM220i with a 20" x 4" super panoramic display. The solutions combine large format display and multi-touch interaction with software and apps that allow in-room and virtual participants to interact with the content using laptops, iPads, and smart phones to collaborate in real time. Visual Collaboration Environments: At the top-of-line are visual collaboration environments that combine large format display, collaborative PC, visual collaboration, and videoconferencing with collaborative and workflow tools, frequently delivered as cloud services, that mirror the content between rooms, provide easy-to-use tools for manipulating/organizing the content, customize the user interface for a particular organization, and create projects and workspaces where teams can customize data elements and feeds. A common use case might be an Agile-Scrum sprint planning session or high-level business review looking at ERP or Salesforce.com dashboards from multiple business units for a recurring meeting. Particpants can have a meeting where the information has been thoughtfully organized for the executive team, whose members can be participating locally and virtually, in a way that brings rapid understanding. During the meeting everyone can capture the notes, participant-shared data, and action items to the meeting's "workspace". The next time the meeting occurs that data can be easily accessed to pick up seamlessly. New member on the team? You can bring them in and set them in front of the big screen(s) and walk them chronologically through past meetings to bring them up to speed. Players in the space include: Oblong Mezzanine, Prysm Cascade, and Bluescape. Oblong Mezzanine (left) 3 has three primary screens and can add up to 3 side displays (known as visual corkboards) for persistent content or additional data/feeds. Prysm's Cascade 190 (right) has 75 sq feet of display space with smaller options including 65" and 85" panels and a 117 inch video wall as well. Oblong, whose CEO and founder John Underkoffler is famous for designing the UIs for Minority Report among other innovations, was showing off Mezzanine 3 which has upgraded to 4K displays that support 4K content and better capabilities for remote participants to present content from their laptops for meeting participants in the environment and receive content shared during the meeting. The Nureva Span is a new solution with an amazing amount of potential. The Span combines one or two short-throw, super panoramic projectors that provide either a 4' x 10' or 4' x 20' foot multi-touch enabled, large-format projected display. The Span hardware is coupled with ideation software that runs on your browser, tablets, and smart phones that allows either local or virtual team members to make changes to the workspace in real time. The system is being marketed for ideation but there is lot of potential for other applications when you have up to 80 square feet of digital canvas to work with. Agile-Scrum, lifesize telepresence, and trello are a few applications that pop into mind. Two years ago I was an invited guest to AVI-SPL's Global Sales Meeting where I sat down with the company's top executives and they asked me what I thought the next "Big-Big-Thing" was going to be (or could be). My answer was the Interactive Display (which at the time I was referring to as the "iPad of the conference room"). The short explanation for that choice is: Every conference room (IMHO) needs a display, a collaborative PC, videoconferencing and an interactive whiteboard capability. I explained the rationale in more detail in the cover story on Cisco Spring Roll from last year's Telepresence Options Magazine. There are an estimated 12 million+ conference rooms in the world and to effectively share information in groups and move to a digital workflow all would benfit from having some combination of those elements. The all-in-one combo device built around a large format HD/4K display will definitely be the sweet spot and collaborative environments such as those from Bluescape, Nureva, Oblong Mezzanine, and Prysm will be for those with the requirements and budget for something more sophisticated and/or for where you want to WOW! your partners and clients. I spoke to Mark Cray, CEO of AGT.. one of the leading integrators for collaboration rooms, at the show and they are building quite a business around turning conference rooms into collaboration rooms using the MondoPad and have knocked down deals over 45+ rooms. For the Pro-AV industry this will be where the bread gets buttered for the next couple of years and the best shops will be able to integrate the basics of the Interactive Display with immersive telepresence for improving the human factors of participants and improving inter-company video capabilities to improve the ability to effectively collaborate with partners, vendors, and clients. Immersive Telepresence in the future? We covered Cisco's work on integrating telepresence into their interactive display proof-of-concept SpringRoll in last year's cover story for Telepresence Options Magazine and Microsoft's R&D team is public about their desire to create a "Magic Window" into remote locations and included lifesize telepresence into their recent Productivity Future Vision video. Right now Mondopad 2.0 and SurfaceHub are both delivering a solid "9" out of 10 on the ability to collaborate with data but Mondopad is at a "3" and Microsoft at a "4" on the human factors of the video experience. It will be interesting to see which company can crank that number up first or if Cisco can actually get Spring Roll into the game. Apps are also going to be key and, as I have written before, software developers are, no doubt, trying to figure out what is the business equivelent of candy crunch once employees get the ability to buy apps for the conference room on the company account. The Winners: Right now on the commodity level the two leading platforms are the MondoPad 2.0 , from the (relatively) small and nimble InFocus and the SurfaceHub from Microsoft. Microsoft is finally seeing the fruits of its acquisition of Perceptive Pixel lead by Jeff Han who Telepresence Options has been following since his video on multi-touch interaction went viral in 2006. The reason for the Tie? Various... MondoPad is on version 2.0 and shipping where as SurfaceHub is V1.0 and not yet shipping. MondoPad has a lower price point but SurfaceHub is designed to work natively with Windows 10 and Microsoft has the advantage of designing the SurfaceHub experience into their other platforms like SurfacePro, tablets, and Windows software. SurfaceHub is 4K UHD while MondoPad 2.0 is HD. So.. It's a toss up... Let's call it a Tie! I'll close with congratulating both companies on superb solutions and warn the reader to get their popcorn: There is going to be a "knife fight" in this space! The SMART kapp iQ is a step down from what I am terming an "Interactive Display" because it doesn't have a collaborative PC or videoconferencing but, those capabilities aren't always necessary in every conference room and they come with their share of headaches for IT to support, secure, patch, license, and update a shared computing capability in multiple conference rooms. I already stole my thunder on the Kapp IQ earlier in the article where I shared that CMO Jeff Lowe told me they think they have made IQ simple and easy enough to sell through traditional office furniture channels vs. the Pro AV and Systems Integrator channels (although they are going to play as well). 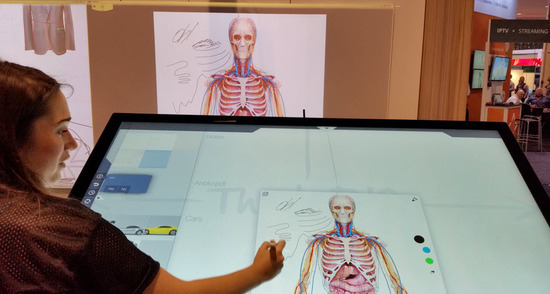 The IQ wraps up a 4K display and SMART's interactive whiteboard technology in an easy-to-use package but relies on software running on the desktop or tablets for the interactivity so the device itself doesn't have the same security issues as a PC. 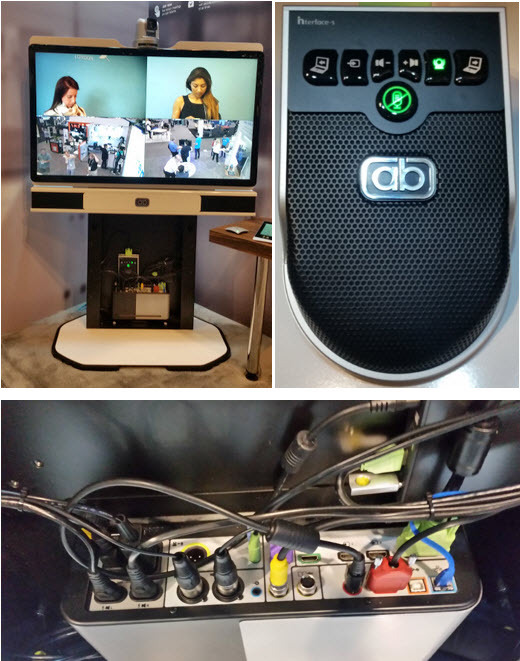 I first looked into We-Inspire after one of our consulting clients on the Human Productivity Lab side of the house asked us to take a look and we did a story on Telepresence Options but InfoComm 2015 was my first time to actually get to try their solutions in person. We-Inspire bills themselves as a ideation tool for creatives and the company is fielding a number of different solutions and form factors that combine into a seamless group-based collaborative experience custom tailored to creatives who require precise fine details and much wider palette of colors and graduations. The solution is based on digital pens from Anoto, We-Inspire's software for creatives, and between 1-4 short throw projectors that create a wide-format digital canvas. Write (a pen and paper function that uses a conventional form factor pen to write on special paper that can be ported to the "big screen"), Capture (connects external devices), Brainstorm (makes the we-inspire board a digital sticky note wall), Core (pipes in Windows applications) and Sketch (draw vector-based art directly on the board). The Optika Collaborate 65UHD is a 65" multi-touch 4K display that has been paired with We-Inspire's software and Anoto's digital pen technology to create the personal workspace equivelent of a Ferrari for creatives. In this picture you can see the content being replicated in real-time on the We-Inspire "Projectors"
Optika and We-Inspire were both exhibiting in the Anoto booth at InfoComm and they were showing off Optika's Collaborate 65UHD. We-Inspire software running on a brand new 65 inch 4K UHD display paired with We-Inspire's software and Anoto's digital pen technology. The system which costs $8400 without a stand could be a shared resource in a conference room but the set up at InfoComm was the panel on a stand angled like a drafting table. The ultimate 4K digital canvas wrapped with the ultimate digital tools for the digital artist of today. The company has plans for both 55 and 85 inch versions in the coming months and a variety of stands to compliment the offering. Most people know Prysm for their proprietary Laser Phosphor Display technology that makes possible gigantic video walls visible from almost any angle that sip power and don't require as frequent maintenance as competitive solutions. What seems to be less known about the company is their new line of touch sensitive panels at 65 and 85 inches that compliment the 117" and 190" video walls and Prysm Synthesis, the software that powers the interactive collaboration in the room and between other Synthesis-equipped rooms, video walls, and panels. The Synthesis software powers multi-touch interaction with the panels and video walls, scales content approprietly between different size displays, mirrors the content on other walls and panels to create collaborative workspaces that can include videoconferencing and connect with other Prysm equipped rooms (or regular videoconferencing rooms) for collaborative work. The software also has workflow tools that gently move teams to an all digital workflow and improve the rate at which information is absorbed and understood. The company announced Synthesis 2.0 at InfoComm that improved the number of Synthesis sites that can particpate: 10 and simplified the ability to stream data from the panels or Synthesis software running on laptops to traditional videoconferencing rooms. The Starleaf GTm 5220 is Starleaf's new solution for integrating group videoconferencing into a Microsoft Lync/Skype for Business environment. What makes the GTm 5220 so cool? Let's start with Starleaf itself! High quality cloud-based video with lightweight desktop and mobile clients like Breeze, integrator-friendly group end-points like the GTm 5220 for Lync and low-cost options like the GT Mini 3330 for huddle rooms and smaller spaces. The GTm 5220 has all the inputs and outputs the pros like for complex installations but comes standard with Starleaf Touch control panel to make everything easy for the end-users without the need to buy and/or support a Crestron or AMX touch panel. Check the Video Here. An Ashton Bentley Connect one55 (top left), the company's tabletop Interface-S microphone pod(top right) has easy-to-use controls for users and VGA connections for sharing data, the Ashton Bentley Abox (Bottom) provides connections for everything and the ability to remotely monitor and manage the system. This wasn't a new product launch for Ashton Bentley, it was just the first time I have seen them at InfoComm where I can give them an award! The company makes the best videoconferencing stands in the business but unless you dig down deeply into the technology and guts of what they are doing you might miss the magic completely. The company was co-founded by Roger Vinton, a top-tier systems integrator, and Roger McArdell, who in a previous life managed over 2,000 videoconferencing rooms for Barclays Bank and was frustrated with the complexity of deploying systems to far-flung locales where the local systems integrator may or may not have the skills to get the job done right. After trying in vain to get the industry to build what he wanted, he recruited Roger Vinton and Ashton Bentley was born. "Amateurs talk about tactics, but professionals study logistics." The magic here is that every detail in every Ashton Bentley system has been thought out to not only simplify the installation but the monitoring and remote maintenance as well. They throw in ease-of-use for the end-users for free. Every system comes flat-packed and can be installed in usually less than an hour and doesn't even require a screw driver. Each system breaks down to packages weighing less than 150 lbs to fit under the FedEx maximum for air-freight and fits in a standard elevator. Every system is front-servicable, the cables are color-coded, and amplified audio and an HD display are included. The abox central AV processor is an Ashton Bentley exclusive and provides system control, signal routing, audio processing and power distribution. End-user control is simplified with an easy-to-use control interface that can either sit on the table or be integrated into the table and the systems can be remotely managed including cycling the power on any component using absee, the company's remote monitoring and management server. The company was showing off the Connect one55 in the Starleaf booth but you really need to see the entire product line to appreciate what they are doing. The Boardroom two70 is my personal favorite. Polycom's RealPresence Web Suite was something that I stumbled across during a briefing with Polycom's Laura Shay that I wasn't expecting to be that cool but where I ended up being pleasantly suprised. With the tremendous installed base of Polycom end-points this is something that has a lot of potential to improve the data collaboration experience of lots of people. The solutions enables a single "click-to-meet" link that gets inserted into an e-mail calendar invite for a meeting. Participants who don't have Polycom end-points get in to the meeting's "workspace" (which can be persistent) using WebRTC & HTML 5. The system will support up to 3 WebRTC participants (no plug-ins) without using MCU resources which frees up valuable ports for Polycom's big iron clients. The solution offers chairperson controls to mute partcipants, HD content sharing, group chat, session recording, HTML 5 support for sharing up to 5 documents simultaneously, and works with Polycom's Team Board for whiteboarding and annotation. Check the Video Here. The Phoenix Condor is a multi-microphone array deploying multiple directional audio beams to cover an entire room. The system features echo and noise cancellation with a range of more than 20 feet and up close as well. While I examined the system at InfoComm, I had to wait until I got back to do a video call with Phoenix's Jonathan Boaz to test everything out. Phoenix had the system deployed in a fairly large conference room on the corner of a building with glass walls on two sides, one of the worst environments possible for audio. We experimented with multiple people speaking, both far (18-20 feet) and up close (1-2 feet) and speaking simultaneously. The system performed flawlessly. The MSRP on the Phoenix is $1250 and will start shipping in September. 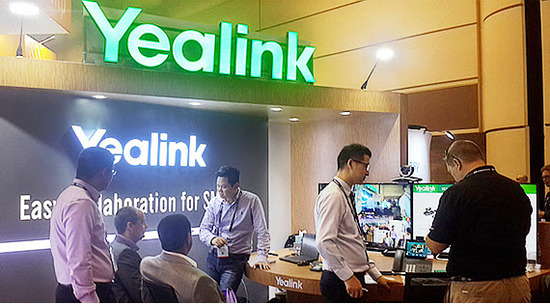 It's not often that billion dollar companies jump into the crowded, little pond known as the videoconferencing industry but Chinese UC firm Yealink, better known as the #2 manufacturer of SIP handsets globally, showed up with a suite of standards-based videoconferencing solutions and video handsets. The videoconferencing solutions include a number of1080p-capable systems including the VC120 (includes a microphone pod / SIP phone, PTZ camera with 18x optical zoom, MSRP of $5,499); and the VC400 (similar to the VC120, but includes a 4-site 1080p-capable video bridge that can be upgraded to 8-sites, MSRP of $8,000. The company also had a number of video handsets with the flagship being the VP530 HD IP Video Phone. but... unfortunately.. missed InfoComm 2015! Array Telepresence, a telepresence start up where, in the spirit of full disclosure, I must inform you that I am a principal, stunned InfoComm 2014 with a demonstration of the company's image improvement technology that enables lifesize, immersive telepresence in conventional conference rooms using existing videoconferencing codecs. 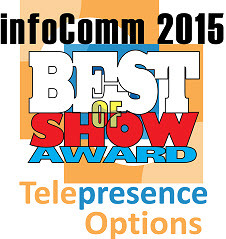 The company scanned almost 500 visitors at InfoComm 2014 as a first time exhibitor, gave demonstrations of Array's prototype technology, won awards and accolades, and signed up some of the world's leading systems integrators as partners. Since InfoComm 2014 the company has productized the DX Camera and Image Processor. The final form factor of the DX Camera module reduced the space required between dual-displays from 30.5mm to just 4mm and the system now sits on and is concealed by the display bezels. The company debuted the new product at Enterprise Connect in March and in London at the Business Breakthrough in May. The company sold out its initial production run and the majority of the systems have shipped to leading systems integrators where they are being set up as demonstration systems or leading organizations that are kicking the tires with 2-3 site proof-of-concepts. Starting in the next couple of weeks you will be able to get a demo of Array Telepresence in Minneapolis, MN, Thatcham, UK, Hong Kong, Melbourne, Australia and Johannesberg, South Africa among other locations with even more on the way! Sign up for the Array Newletter to get the complete list and updates when released. 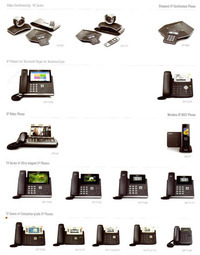 Grandstream, like Yealink, is better known as a maker of UC handsets and video telephony. The company rolled out their GVC3200 Android video conferencing system at InfoComm. The $4,000 product is based on Google's Android 4.4 mobile operating system and offers 1080p full-HD video resolutions, together with up to nine-way video conferences, support for three monitor outputs through 3 HDMI connectors, and a PTZ camera with 12x zoom. One of the unique features is the ability to run and connect to Android versions of popular video calling apps including Skype, Skype for Business, Google Hangouts, Zoom, oovoom, and probably a dozen others that I don't have the time to list. Like My Thoughts and Analysis? Get the Magazine! If you are into visual collaboration and accelerating your organizations' time-to-market, time-to-insight, and ability to do global business effectively with your partners, vendors, and clients... Then get yourself a free subscription to Telepresence Options Magazine. 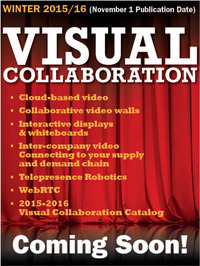 We are changing the name this year to Visual Collaboration Magazine to better reflect the content. We will be looking at the ROI of visual collaboration in the enterprise, collaborative environments, and as usual, we will have the most comprehensive catalog of visual collaboration solutions anywhere. As we like to point out every year, InfoComm is one of our favorite shows because there are so few venues where you can actually go and \"kick-the-tires\" on so many visual collaboration offerings under one roof. It is also a pleasure to get to see so many old friends and make new ones. This year InfoComm set a new all-time high attendance record with 39,105 attendees from 108 countries visiting 950 exhibitors in 515,000 square feet of exhibit space. Bigger IS Better (especially for collaboration!) - For knowledge-based organizations the real ROI of collaboration is both improving and accelerating the rate at which knowledge is created, shared, understood, evaluated, and acted upon. This is going to be the main focus of next issue of Telepresence Options Magazine coming out in November that we are renaming: Visual Collaboration Magazine. In group meetings or presentations, whether local or virtual, just being able to effectively share detail-oriented content like a spreadsheet or a visio diagram with a room full of 40-somethings whose eyes are starting age is job #1 and the bigger the screen the more effective you succeed. But improving readability is only one of the benefits of big pixel spaces: Many of the wireless data sharing tools like Mersive Solstice and Kramer Via Collage and interactive display solutions like the Nureva Span, Prysm Collaborative Walls, and Oblong Mezzanine offer the ability for multiple presenters to share data simultaneously which is definitely a power feature in group collaboration and the ability to keep \"persistent data\" virtually thumbtacked to a portion of the display is helpful in a variety of meeting types. Interactive Display - Interactive Display is my new umbrella term for display solutions that are integrating multi-touch interaction and a collaborative PC at a minimum but are frequently including advanced collaborative tools such as wireless data share, multi-site collaboration and mirroring, interactive whiteboarding, videoconferencing, and workflow tools that super-charge both group and virtual collaboration.The big buzz was around the recently launched Microsoft Surface Hub which has integrated Jeff Han's work from Perceptive Pixel and InFocus who was showing off their MondoPad 2.0 and SMART Technologies was launching their SMART Kapp IQ. I stopped by the Planar booth to look at their 98\" 4K multi-touch UltraRes interactive display but it wasn't working properly so I wasn't really able to review it. I am including the SMART Kapp IQ in this category even though they are going in a slightly different direction forgoing the collaborative PC in favor of a simpler approach where the screen/board is paired with IOS & Android apps for bi-directional sharing. I spoke with Jeff Lowe, SMART's CMO, who told me one of the most fascinating things I heard on the show floor: He was just back from the NeoCon furniture show where they think they have have simplified the product to the point where it can be bought by facilities vs. IT and sold by the same office furniture suppliers that sold you a traditional dumb whiteboard and/or display last year. Ideation and Visualization Environments: Moving up the size/price continuum are projected solutions with interactive touch with the big story being the launch of the Nureva SPAN, an interactive touch solution for ideation with two models: The WM210i with a 10\" x 4\" superpanoramic display and the dual projector WM220i with a 20\" x 4\" super panoramic display. The solutions combine large format display and multi-touch interaction with software and apps that allow in-room and virtual participants to interact with the content using laptops, iPads, and smart phones to collaborate in real time. Visual Collaboration Environments: At the top-of-line are visual collaboration environments that combine large format display, collaborative PC, visual collaboration, and videoconferencing with collaborative and workflow tools, frequently delivered as cloud services, that mirror the content between rooms, provide easy-to-use tools for manipulating/organizing the content, customize the user interface for a particular organization, and create projects and workspaces where teams can customize data elements and feeds. A common use case might be an Agile-Scrum sprint planning session or high-level business review looking at ERP or Salesforce.com dashboards from multiple business units for a recurring meeting. Particpants can have a meeting where the information has been thoughtfully organized for the executive team, whose members can be participating locally and virtually, in a way that brings rapid understanding. During the meeting everyone can capture the notes, participant-shared data, and action items to the meeting's \"workspace\". The next time the meeting occurs that data can be easily accessed to pick up seamlessly. New member on the team? You can bring them in and set them in front of the big screen(s) and walk them chronologically through past meetings to bring them up to speed. Players in the space include: Oblong Mezzanine, Prysm Cascade, and Bluescape. Oblong Mezzanine (left) 3 has three primary screens and can add up to 3 side displays (known as visual corkboards) for persistent content or additional data/feeds. Prysm's Cascade 190 (right) has 75 sq feet of display space with smaller options including 65\" and 85\" panels and a 117 inch video wall as well. Two years ago I was an invited guest to AVI-SPL's Global Sales Meeting where I sat down with the company's top executives and they asked me what I thought the next \"Big-Big-Thing\" was going to be (or could be). My answer was the Interactive Display (which at the time I was referring to as the \"iPad of the conference room\"). The short explanation for that choice is: Every conference room (IMHO) needs a display, a collaborative PC, videoconferencing and an interactive whiteboard capability. I explained the rationale in more detail in the cover story on Cisco Spring Roll from last year's Telepresence Options Magazine. There are an estimated 12 million+ conference rooms in the world and to effectively share information in groups and move to a digital workflow all would benfit from having some combination of those elements. The all-in-one combo device built around a large format HD/4K display will definitely be the sweet spot and collaborative environments such as those from Bluescape, Nureva, Oblong Mezzanine, and Prysm will be for those with the requirements and budget for something more sophisticated and/or for where you want to WOW! your partners and clients. I spoke to Mark Cray, CEO of AGT.. one of the leading integrators for collaboration rooms, at the show and they are building quite a business around turning conference rooms into collaboration rooms using the MondoPad and have knocked down deals over 45+ rooms. For the Pro-AV industry this will be where the bread gets buttered for the next couple of years and the best shops will be able to integrate the basics of the Interactive Display with immersive telepresence for improving the human factors of participants and improving inter-company video capabilities to improve the ability to effectively collaborate with partners, vendors, and clients. Immersive Telepresence in the future? We covered Cisco's work on integrating telepresence into their interactive display proof-of-concept SpringRoll in last year's cover story for Telepresence Options Magazine and Microsoft's R&D team is public about their desire to create a \"Magic Window\" into remote locations and included lifesize telepresence into their recent Productivity Future Vision video. Right now Mondopad 2.0 and SurfaceHub are both delivering a solid \"9\" out of 10 on the ability to collaborate with data but Mondopad is at a \"3\" and Microsoft at a \"4\" on the human factors of the video experience. It will be interesting to see which company can crank that number up first or if Cisco can actually get Spring Roll into the game. Apps are also going to be key and, as I have written before, software developers are, no doubt, trying to figure out what is the business equivelent of candy crunch once employees get the ability to buy apps for the conference room on the company account. I'll close with congratulating both companies on superb solutions and warn the reader to get their popcorn: There is going to be a \"knife fight\" in this space! The SMART kapp iQ is a step down from what I am terming an \"Interactive Display\" because it doesn't have a collaborative PC or videoconferencing but, those capabilities aren't always necessary in every conference room and they come with their share of headaches for IT to support, secure, patch, license, and update a shared computing capability in multiple conference rooms. I already stole my thunder on the Kapp IQ earlier in the article where I shared that CMO Jeff Lowe told me they think they have made IQ simple and easy enough to sell through traditional office furniture channels vs. the Pro AV and Systems Integrator channels (although they are going to play as well). The IQ wraps up a 4K display and SMART's interactive whiteboard technology in an easy-to-use package but relies on software running on the desktop or tablets for the interactivity so the device itself doesn't have the same security issues as a PC. Write (a pen and paper function that uses a conventional form factor pen to write on special paper that can be ported to the \"big screen\"), Capture (connects external devices), Brainstorm (makes the we-inspire board a digital sticky note wall), Core (pipes in Windows applications) and Sketch (draw vector-based art directly on the board). The Optika Collaborate 65UHD is a 65\" multi-touch 4K display that has been paired with We-Inspire's software and Anoto's digital pen technology to create the personal workspace equivelent of a Ferrari for creatives. 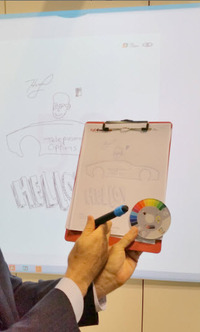 In this picture you can see the content being replicated in real-time on the We-Inspire \"Projectors\"
Optika and We-Inspire were both exhibiting in the Anoto booth at InfoComm and they were showing off Optika's Collaborate 65UHD. We-Inspire software running on a brand new 65 inch 4K UHD display paired with We-Inspire's software and Anoto's digital pen technology. The system which costs \$8400 without a stand could be a shared resource in a conference room but the set up at InfoComm was the panel on a stand angled like a drafting table. The ultimate 4K digital canvas wrapped with the ultimate digital tools for the digital artist of today. The company has plans for both 55 and 85 inch versions in the coming months and a variety of stands to compliment the offering. Most people know Prysm for their proprietary Laser Phosphor Display technology that makes possible gigantic video walls visible from almost any angle that sip power and don't require as frequent maintenance as competitive solutions. What seems to be less known about the company is their new line of touch sensitive panels at 65 and 85 inches that compliment the 117\" and 190\" video walls and Prysm Synthesis, the software that powers the interactive collaboration in the room and between other Synthesis-equipped rooms, video walls, and panels. The Synthesis software powers multi-touch interaction with the panels and video walls, scales content approprietly between different size displays, mirrors the content on other walls and panels to create collaborative workspaces that can include videoconferencing and connect with other Prysm equipped rooms (or regular videoconferencing rooms) for collaborative work. The software also has workflow tools that gently move teams to an all digital workflow and improve the rate at which information is absorbed and understood. The company announced Synthesis 2.0 at InfoComm that improved the number of Synthesis sites that can particpate: 10 and simplified the ability to stream data from the panels or Synthesis software running on laptops to traditional videoconferencing rooms. \"Amateurs talk about tactics, but professionals study logistics.\"
Polycom's RealPresence Web Suite was something that I stumbled across during a briefing with Polycom's Laura Shay that I wasn't expecting to be that cool but where I ended up being pleasantly suprised. With the tremendous installed base of Polycom end-points this is something that has a lot of potential to improve the data collaboration experience of lots of people. The solutions enables a single \"click-to-meet\" link that gets inserted into an e-mail calendar invite for a meeting. Participants who don't have Polycom end-points get in to the meeting's \"workspace\" (which can be persistent) using WebRTC & HTML 5. The system will support up to 3 WebRTC participants (no plug-ins) without using MCU resources which frees up valuable ports for Polycom's big iron clients. The solution offers chairperson controls to mute partcipants, HD content sharing, group chat, session recording, HTML 5 support for sharing up to 5 documents simultaneously, and works with Polycom's Team Board for whiteboarding and annotation. Check the Video Here. The Phoenix Condor is a multi-microphone array deploying multiple directional audio beams to cover an entire room. The system features echo and noise cancellation with a range of more than 20 feet and up close as well. While I examined the system at InfoComm, I had to wait until I got back to do a video call with Phoenix's Jonathan Boaz to test everything out. Phoenix had the system deployed in a fairly large conference room on the corner of a building with glass walls on two sides, one of the worst environments possible for audio. We experimented with multiple people speaking, both far (18-20 feet) and up close (1-2 feet) and speaking simultaneously. The system performed flawlessly. The MSRP on the Phoenix is \$1250 and will start shipping in September. It's not often that billion dollar companies jump into the crowded, little pond known as the videoconferencing industry but Chinese UC firm Yealink, better known as the #2 manufacturer of SIP handsets globally, showed up with a suite of standards-based videoconferencing solutions and video handsets. The videoconferencing solutions include a number of1080p-capable systems including the VC120 (includes a microphone pod / SIP phone, PTZ camera with 18x optical zoom, MSRP of \$5,499); and the VC400 (similar to the VC120, but includes a 4-site 1080p-capable video bridge that can be upgraded to 8-sites, MSRP of \$8,000. The company also had a number of video handsets with the flagship being the VP530 HD IP Video Phone. Grandstream, like Yealink, is better known as a maker of UC handsets and video telephony. The company rolled out their GVC3200 Android video conferencing system at InfoComm. The \$4,000 product is based on Google's Android 4.4 mobile operating system and offers 1080p full-HD video resolutions, together with up to nine-way video conferences, support for three monitor outputs through 3 HDMI connectors, and a PTZ camera with 12x zoom. One of the unique features is the ability to run and connect to Android versions of popular video calling apps including Skype, Skype for Business, Google Hangouts, Zoom, oovoom, and probably a dozen others that I don't have the time to list.